A little over two years ago I was tripping over my business feet. 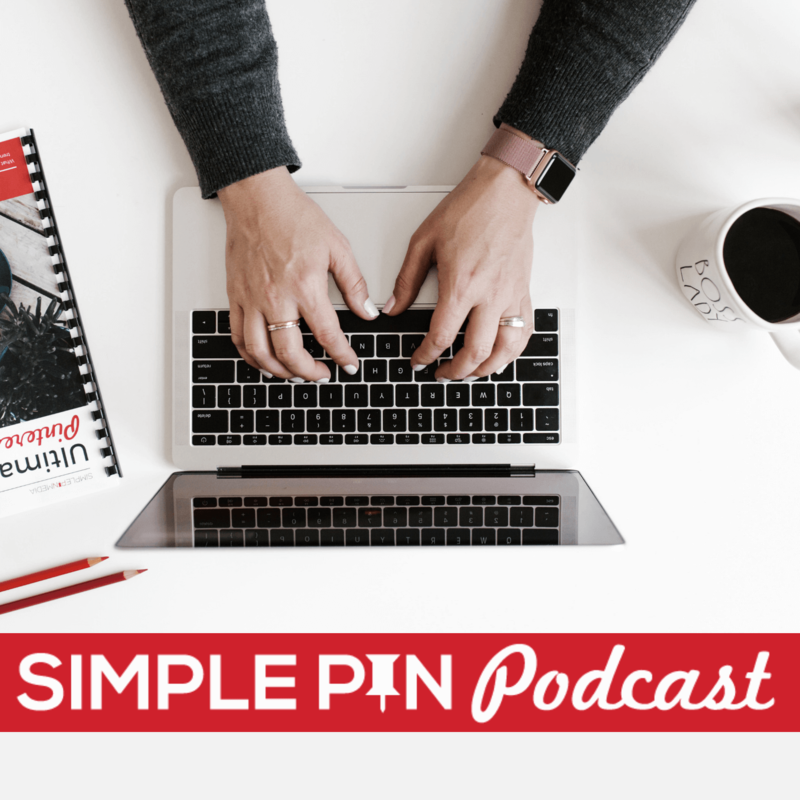 Simple Pin Media was eleven months old, I had eight Pinterest management clients, three account managers and all I could think about was creating products for passive income. I was listening to podcasts, reading blogs, devouring infopreneur emails all while spinning my wheels. I kept teetering back and forth about my business. Did I or didn’t I want to grow a social media management company? Specifically Pinterest? Was I all in or was I just going to sit back and let fear keep me from reaching my goals? If you’ve listened to the Simple Pin story, I shared how I used ‘beta’ to hide behind for a very long time. In November of 2014, I made a conscious decision to invest in my business. I would invest in business coaching. It felt like a huge expense to swallow but I was standing in my office, looking at a desk of scribbled notes, dreams, visions and no plan to implement any of it. I needed someone to listen, offer feedback and give me a list of things to do that would grow my business. Direction was lacking and if I didn’t get some soon I was going to crash and burn. The first few coaching sessions were tough. I laid all my ideas out on the table just to hear, “that’s not what we’re going to focus on now”. Wait, what? Isn’t passive income the way to go? That’s how I’m going to make the big bucks. Let’s start talking about products. Nope. We were going to focus on what was in front of me and that was a steady stream of client requests landing in my inbox. That’s where my income was and I had to create a plan for growth. I spent the next two years working on developing systems for onboarding, client retention, hiring team members, team training, managing team members, data systems, developing new positions and building a company that was professional, helpful and resourceful. Products were created too, just not in the way I had envisioned. Make sure you listen to the episode as I list the tools I use all the time to grow and maintain my business. Have I gotten it right every time? No. But in the last two years, I’ve developed a streamlined system for managing and growing a social media management company that brings in six figures a year, net. This system can now be replicated and reproduced using any social media platform, not just Pinterest. In the podcast, I talk about specific systems for email management, growing a team and the video screencast program I use to record my training videos. Make sure you listen for those tools. Simple Pin Media now serves over sixty clients and has twenty accounts managers (part-time), two team leads, one team trainer, an operations manager and a creative director. I could not have developed Simple Pin Media into what it is today without coaching. I needed someone to hold my feet to the fire, give me a list of action items, celebrate my wins, learn from the losses and push me to create something I never thought I could have. I know there are several of you listening/reading that work in social media management. You are in the exact same position I was a little over two years ago. You want to take your business to the next level but you’re spinning your wheels. You have no idea where to start, the scratch pieces of paper are stacking up with ideas and if you read one more post about someone making $10K in online product launches you might just jump ship on this whole idea. I want to help you build your social media management company to the size and efficiency that you want it to be. Whether that’s part time or full time, I can help you get there. I know how to build a system that will help get the results you want. How am I going to do it? By offering social media management coaching! I want to listen to your dreams and goals and use the knowledge that I have to help you build your own social media management business. Those who want to learn more about social media management coaching can head here to get all the details and fill out the application. Those of you who aren’t in a position to invest and grow your own social media management business, I wish you great success where you’re at right now. Keep focused, committed and never afraid to learn from your mistakes. Very exciting step, Kate! Congrats and much success to you and your coaching clients. Definitely going to keep this in mind! You would be an awesome coach! Let me know if you have any questions. Would love to help! You really doing fantastic job and people will definitly learn additional tips and strategies regarding social media from you. Social media tools can help you succeed, whether you are a job seeker or business owner. Working inside of an organization is all based upon the specific needs of that organization. Social Media is a powerful tool that makes it possible for businesses to connect with their clients like never before. Building these types of relationships increases customer loyalty, driving repeat business and referrals. Eventually, thanks for sharing your experience with us. I’ve considered hiring a coach for quite a while – I love how your coach kept directing you back to fundamentals. I don’t run a social media management business – can you recommend a more general coach? Or might you do that as well? Reach out to Leslie — leslie@becomeablogger.com and tell him I referred you. 🙂 He’s a great coach. This sounds amazing, I think you would an amazing coach!